Author of one of the definitive books on the history of the navy’s involvement in the War of 1812, Theodore Roosevelt understood how important a strong and vital naval force was not only to America’s security but also its diplomacy. He was an early champion of viewing the navy in this way and as a president fought for the fleet’s expansion and modernization. In 1907, he famously sent 16 battleships on a 14-month around-the-world cruise, widely seen as a diplomatic and public relations coup. For these reasons, Theodore Roosevelt is considered the father of the modern navy, and that, in turn, was behind the Navy’s decision in 1981 to name the fourth of 10 Nimitz-class aircraft carriers in honor of TR. 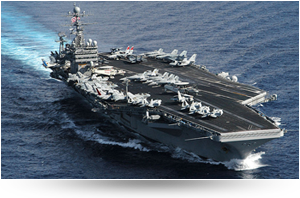 CVN-71, better known as USS Theodore Roosevelt, was officially commissioned on October 25, 1986. This nuclear-powered super-carrier has a storied history of supporting naval operations around the globe in her quarter-century of operations. Since TR’s commissioning, the Theodore Roosevelt Association has been a support organization for CVN-71, also known as The Big Stick, helping outfit the ship’s on-board museum, chapel, library and crew lounge. Each year since 1992 the TRA also has bestowed the Theodore Roosevelt Junior Officer Leadership Award on junior officers on board USS TR who best exemplify the qualities of leadership, pride, professionalism and dedication to duty that were inherent in Theodore Roosevelt. October 25, 2016 was the 30th Anniversary of the USS Theodore Roosevelt (CVN-71). The Commanding Officer of the ship, Captain Craig Clapperton, shared with us a very special message and inside look at the ship and her crew.